In the world of custom building, the frame is the bit you leave alone—unless you really know what you are doing. Anyone can chop and loop a subframe, but creating a stress-bearing main frame from scratch takes patience, guts and familiarity with concepts like torsional stiffness and tensile strength. That’s one reason the custom scene tends to develop slowly. But occasionally someone comes along and chucks the rulebook in the bin. 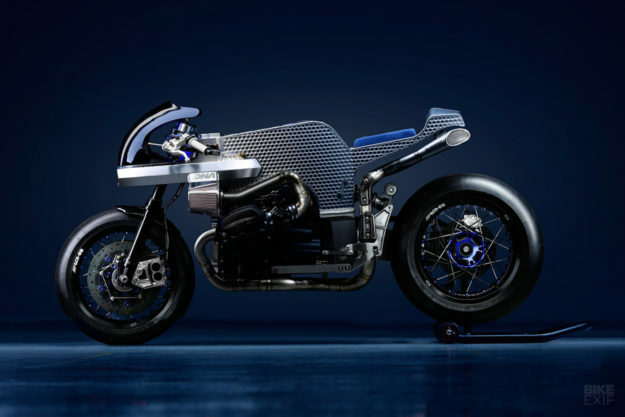 Which is exactly what a father-and-son team from Greece have just done, with this incredible monocoque built around a BMW R nineT engine. Dino and his son Marios Nikolaidis run DNA Filters, the company that makes some of the best aftermarket intake systems money can buy. 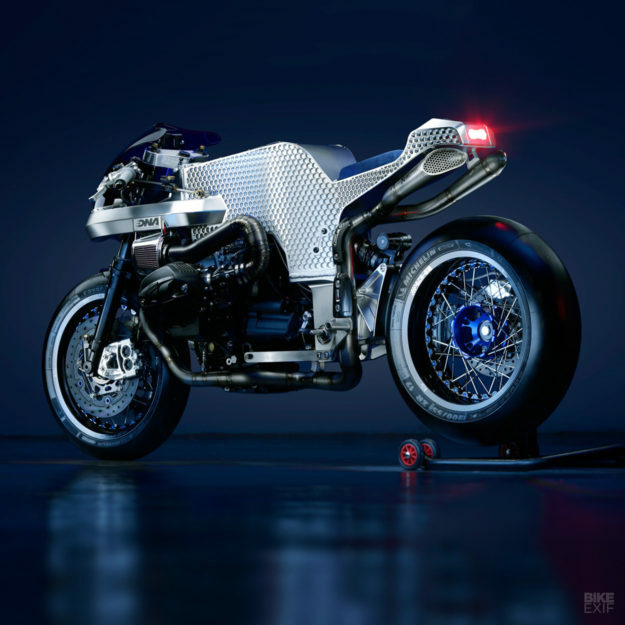 They stunned us with their KTM RC8 a year ago, but they’ve really outdone themselves this time. 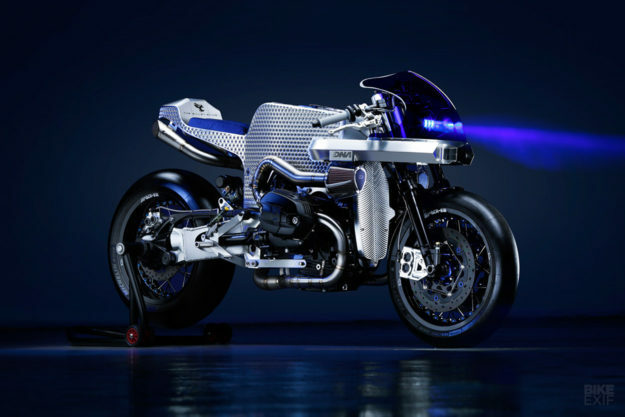 Marios grew up buzzing around on a little monocoque 80cc racer, and then studied Motorsport Engineering at London’s Brunel University. 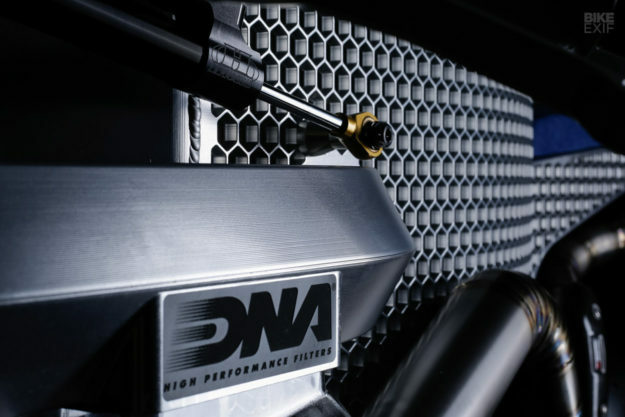 That’s where the inspiration and the skills came from, and DNA’s in-house engineering team helped out too. The honeycomb monocoque on ‘DCR-018 Billet Sting’ is CNC-milled from ten billets of 6082-T651 aluminum—a high-strength grade that’s easily machined and commonly found in everything from cranes to beer barrels. On the steering head and suspension side, Dino and Marios have opted for sportier settings more akin to the racetrack than the road. They’ve installed a custom 43mm Hyperpro fork, with ‘right way up’ construction to reflect the heritage of the Boxer engine. The specs are ultra-modern, though: coated tubes, 110mm of travel, adjustable high- and low-speed compression damping, adjustable rebound damping, and a progressive springs. Hyperpro also supplied the multi-adjustable shock for the rear end, but the real action there is in the swingarm. It’s CNC machined into a Z shape, connected to the lower part of the frame via two giant 40 mm bearings, and with the exposed cardan shaft running through it. 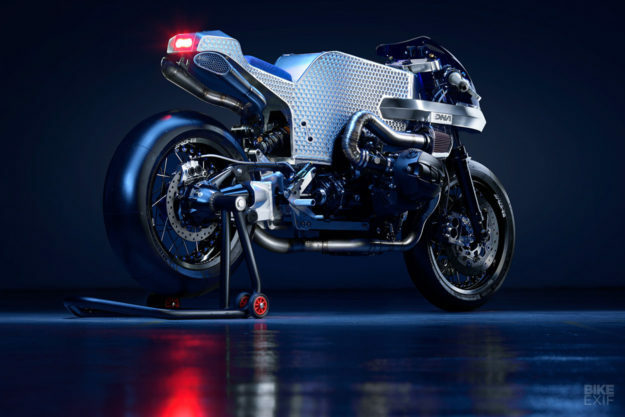 The swingarm was also designed to accommodate a 200 mm wide Michelin Power Slick Evo tire—a racing-derived compound popular with trackday riders. 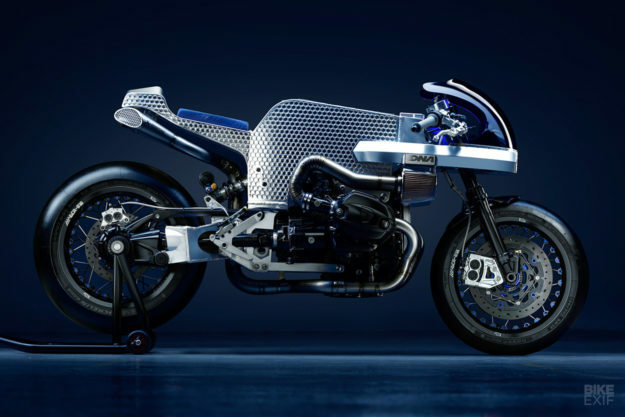 DNA is in the business of performance improvement, and they’ve managed to give the R nineT motor a solid boost without messing with the internals. It now measures 122 hp at the back wheel. The power jolt comes from an extraordinary intake system: two 600 mm (23 inch) hexagonal tubes that channel the air to a pair of 66 mm DNA filters in transparent Lexan airboxes. The aluminum tubes also support the fairing and LED headlights. CNC machined from huge blocks of 6082 alloy, the tubes provide increased pressure at speeds above 160 kph (100 mph), and zero flow restriction at lower speeds. 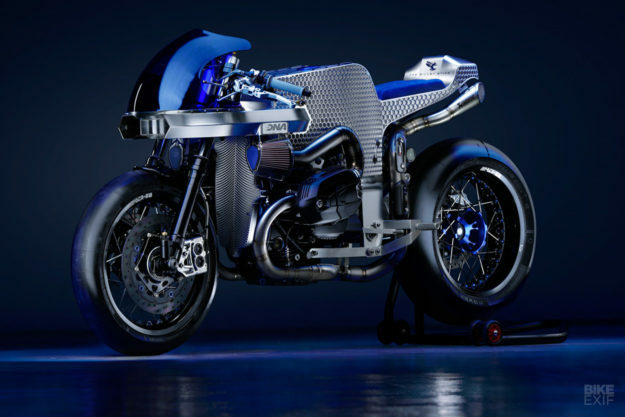 They’re matched to a titanium exhaust system, custom designed by Akrapovič. 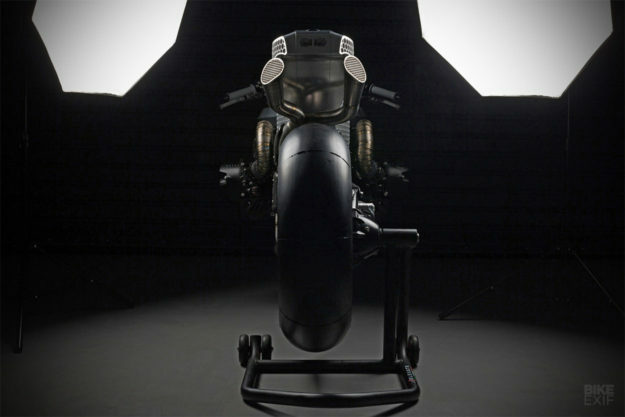 The mufflers are finished with a honeycomb grill to match the monocoque, and follow the contour of the seat. A new ECU takes advantage of the intake and exhaust upgrades, and delivers that extra 10 hp to the back wheel. 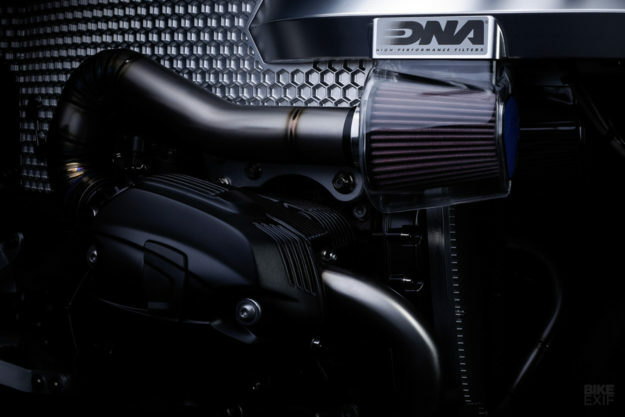 DNA have even hooked it up to a sensor on the gear lever: as soon as the rider applies force to change gear, the ECU momentarily cuts ignition for a few milliseconds to allow the next gear to slip into position without the use of the clutch. This is one of those bikes where you could run to 2,000 words going over all the details, and still inadvertently leave something out. 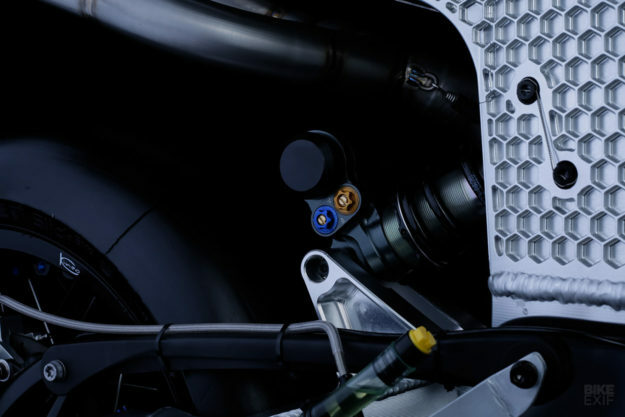 Everything is absolutely top-shelf, right down to the ISR brake system, with four-piston CNC machined billet calipers front and rear—plus race-ready master cylinders. 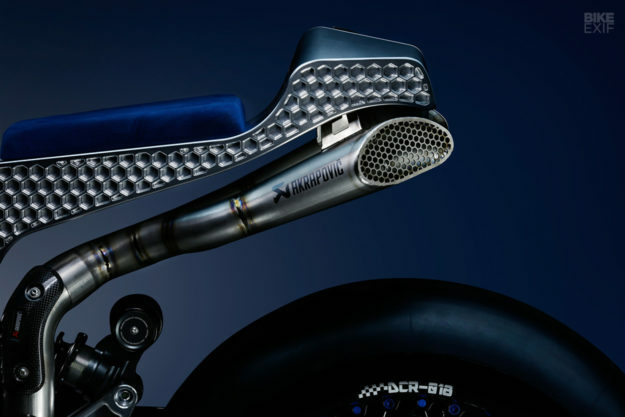 The tiny reservoirs sit ahead of a massive top triple clamp, which has a honeycomb finish to match the monocoque. 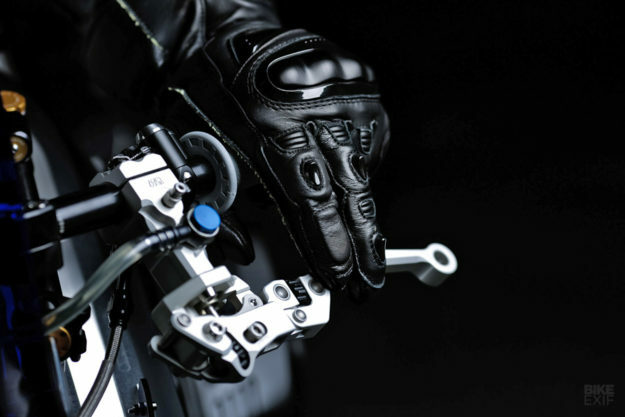 The clip-ons house switches from Purpose Built Moto, and there’s a Hyperpro steering damper to control any twitchiness. 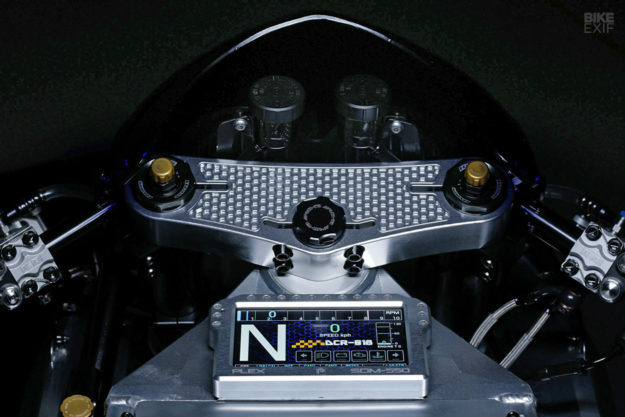 On top of the ‘tank’ is a custom instrument display/telemetry controller from Plex Tuning. It’s an extraordinary 4.3” TFT display that can be configured to show virtually any data coming from the ECU, above and beyond the usual speed and rpm readouts. Pore over the images in detail, and the clever little tricks keep popping out. We especially love the oil cooler, machined out of billet aluminum and resembling the vertebral column of a fish. The cooler fits snugly against the front of the engine, leaving just the air-cooling ‘bones’ exposed. Billet Sting is one of the most creative customs we’ve seen in a long time. And even better, it’s creative because it’s more than just an exercise in aesthetics: it pushes technology and modern manufacturing techniques to the limit. Kudos to Dino and Marios for not just thinking outside the box, but blowing it to smithereens.